Pitt headed to Chestnut Hill to square off with Boston College on Tuesday night and ultimately suffered a 66-57 loss. However, according to ESPNU, the real story wasn’t the result, but Eagles guard Ky Bowman. If there was any doubt about that, ESPNU commentator Rich Hollenberg quickly eliminated it, noting less than a minute into the broadcast, “We’ll be talking about Ky Bowman a lot tonight, and deservedly so.” That certainly proved to be the case, as what ensued was a movie-length lovefest in Bowman's honor. During the first half, the cameraman’s gaze was fixed on Bowman constantly, and Hollenberg, flanked by an equally effusive Debbie Antonelli, whiled away the time by spewing non-stop praise for Bowman. The duo went so far as to say that the Boston College star was second only to Duke forward Zion Williamson in the ACC in terms of talent. They also put up his freshman stats side by side with Xavier Johnson’s, showing that Johnson had the edge. But even that was taken and molded into a positive for Bowman by Antonelli. The unrelenting praise from Antonelli and Hollenberg reached a crescendo at the end of the first half. That was due in part to the incorporation of the Ky Cam, a dedicated camera fixed on Bowman at all times and presented on a split screen. Described by Hollenberg as “bonus coverage,” the Ky Cam made its debut at the 3:53 mark and lingered on screen for a minute and 20 seconds. Shortly after that, a timeout was called, during which ESPNU ran a Bowman highlight reel. The Ky Cam played a more prominent role in the second half, as it elbowed its way back on screen at the 15:07 mark and remained until a break in play at 12:49. It was then used intermittently throughout the remainder of the game, much to the chagrin of the Pitt faithful. As a result, many viewers from the Pittsburgh area took to Twitter to voice their displeasure, with the split screen and general lionization of Bowman absorbing the brunt of the blows. Why is there a separate camera focusing on Ky Bowman?? And why do these announcers think he’s the next Jordan? You’d think Ky Bowman would take a break from walking on water or feeding the masses with a single fish and maybe score a bucket this half. While Bowman is clearly a gifted athlete, ESPNU's decision to celebrate him nonstop as a supposedly neutral party was bizarre. The network's timing was also a bit off, as Bowman’s effort on Tuesday was not one of his best. 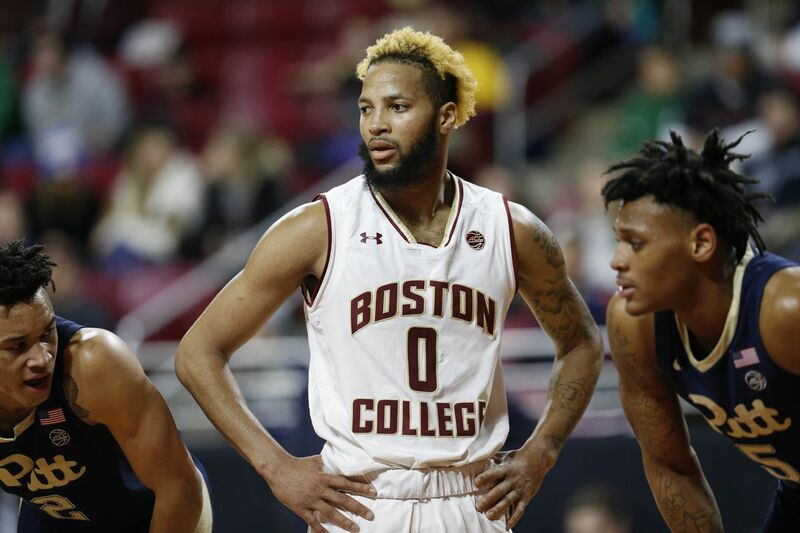 While he led his team in scoring, with 14 points, he was Boston College’s least efficient shooter, converting on just 25 percent of his 16 shots. He also had four turnovers in the game, and the Ky Cam caught him missing a layup and getting called for an offensive foul. All told, the incorporation of the Ky Cam into the broadcast was a curious move by ESPNU, and it did less to highlight a standout player than it did to alienate half of the game’s viewers. It’s unclear if it will be worked into future Boston College broadcasts covered by the network, but Pitt won’t face the team again this season, meaning it will be another fanbase’s problem if it does make a return.